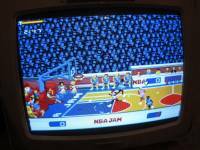 View topic - NBA JAM for the Master System - Forums - SMS Power! Here's what I got in the mail this morning. - The two-players mode is functional. - The game is dated 1994 (whereas the GG version is 1993). OMG, I think I just wet my pants, I would of loved to have had NBA Jam on the sms, the GG port was pretty playable. This may seem like a dumb question, but what's so special about the SMS version of NBA Jam? Is it any less common than the GG/MD versions? Or any less common than Alien 3, Krusty's Super Fun House or Crash Dummies? Nice find BTW, looks pretty cool :). PD: Loved that old school rgb monitor.. It could also be a prototype cartridge that was never commercially released by Acclaim. The possibilities for one of those rare prototypes being found in a small country in South America are 1 in a million..... I highly doubt it was a prototype. 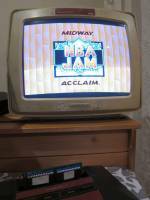 SMS NBA Jam... perhaps someday SMS Arch Rivals will turn up too? Very nice find indeed, congratulations. Is it as awesome as Great Basketball? Hopefully it's better than SMS Pat Reilly Basketball. Wow, this looks pretty damned cool. The story is quite a nice one! I bought several prototypes from someone affiliated to an ex-developer. This particular one was advertised as being an Hang On prototype! As I often do I bought all his Sega 8-bits prototypes anyway. The package then went on missing. I trusted the seller so at some point I assumed it could have been lost in the mail, then I forgot about it for a bit. Then finally arrived to me after more than two months (with no explanation from the post office). 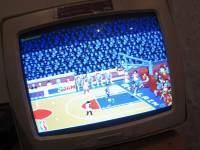 It wouldn't run on the Master System and only when I dumped it I found out the surprise that it was NBA Jam! I first thought it was a Game Gear ROM copied to a SMS cartridge but no - the palette is correct and the game include a 2 players mode, so it is indeed a conversion of the game for the Master System. Now the reason the seller thought it was Hang On is because the ROM image doesn't contain a valid Sega header. 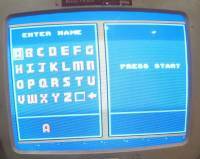 So running it on an unmodified western Sega Master System would show a software error screen or revert to the game in the console.. which happened to be Hang On. To use Turbo in game, double tap any direction and it will stay engaged until you stop moving. 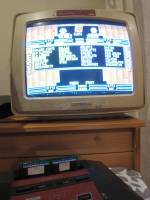 It wouldn't run on the Master System and only when I dumped it I found out the surprise that it was NBA Jam! Yeah, that's a great story! Second, I tried the cheats of GG version and all worked perfectly. Exceptions: Use instead to play as Mark Turmell and Warren Moon. And the Juice Mode code don't worked. Any alternative way to make the Juice Mode work? EDIT: You can use the Button for both players 1 and 2. The news topic has it. Any alternative way to make the Juice Mode work? x 14, +. The press of button 1 acts differently from the GG version so the same underlying code has to be entered slightly differently. Im the programmer both game gear and PS1 versions of NBA JAM.. I did the MS conversion and it was finished, but we had the problem of the buttons.. The arcade and all other home conversion used the same 3 buttons.. But the MS only had two and we could not find a acceptable way of making it work so the game was shelved. Good find coz i don't even have a copy of this..
Has this been tried on a everdrive/tototek sms cart?